Ryan Schierling: Nine things I photographed today with a point-and-shoot camera, and one thing I didn't. 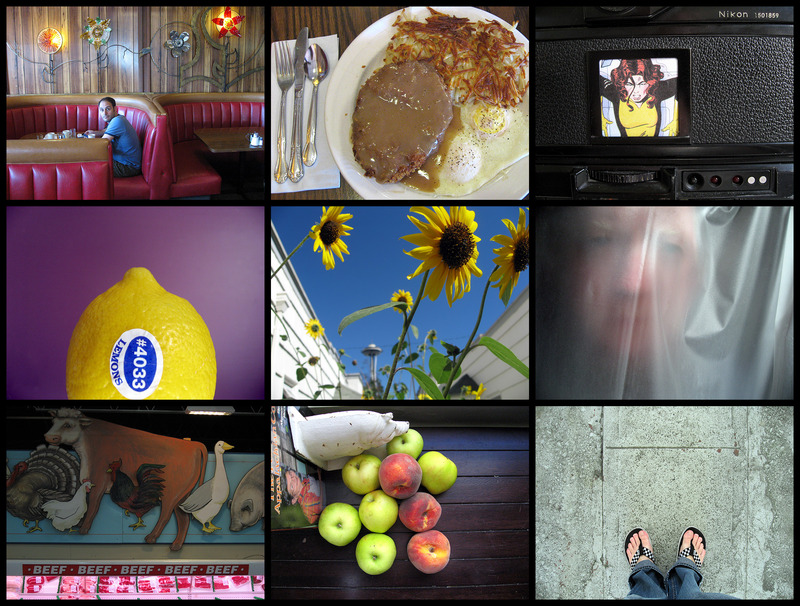 Nine things I photographed today with a point-and-shoot camera, and one thing I didn't. I had to run an errand downtown this afternoon, and I chose to drive instead of walk, like I normally would. My ankles were hurting like crazy from a run and there was no way I was going to make it to 4th and Pike as a pedestrian. So, I left the house in the car, fretting that I was going to never find a parking spot or that someone would do something stupid and wreck themselves into me, or me into them. I've gotten a bit automobile paranoid in my late 30s, and I blame that on living in a city with horrible traffic, horrible drivers, and the fact that most cars now are like your living room – comfortable, street-noise free vessels that have your phone, your DVD player, your stereo, your comfortable leather recliner (heated, of course), your GPS system, your Big Gulp in one of six cup holders, et al, and that most people drive their cars accordingly, like the completely oblivious and distracted morons they are. Once downtown, I circled the block I needed to park on for a good 30 minutes. Then I circled the eight blocks outside of the block I needed to park on for another 30 minutes. Frustrated, I decided to drive home and take care of the errand in the morning, when I was feeling better about the walk, at least from the monorail. Heading north, at 3rd Ave. and Pike, the light turned yellow. The car in front of me accelerated, as most cars do at a yellow light, and sped through the intersection. The next thing I saw was a man, wearing khaki cargo shorts and a white shirt, being ragdolled backwards over the right-front corner and top of the car that ran the intersection, his shoes flying in different directions and his shorts coming halfway off. Blood, flowing from his head after he hit the street, saturated his white t-shirt and began to pool around him. The car that hit him slowed a bit – I remember brake lights – and then sped off up the street. I felt sick, like my stomach was jolting up out of my body in slow motion, spinning a bit and dropping back in. The light was still red. People on the corner were bringing their hands to their faces and calling 911 on their cell phones and gathering around this man who had just been thrown through the air by an automobile. I don't remember if he stepped into the crosswalk while the light was yellow. I don't remember if the light was red when the car sped through the intersection. I don't remember anything other than the stilted, bloody, ragdoll-like spin of a man momentarily in the air before hitting the pavement.